Last week I made a list of Liao dynasty place names written in the Khitan Large Script that have been identified in Khitan epitaphs and manuscripts (Khitan Geography Part 1), and this week I have done the same thing for the Khitan Small Script, although as some Khitan Small Script inscriptions date to the Jin Dynasty, this post covers both Liao dynasty (907–1125) place names and Jin dynasty (1115–1234) place names. 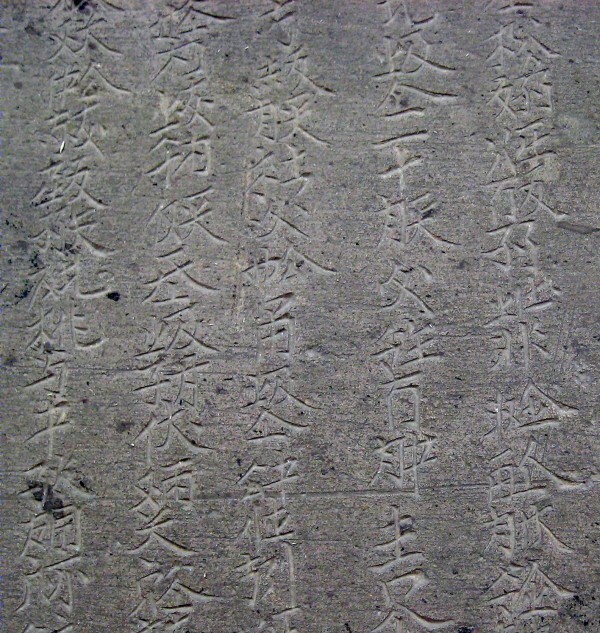 As is the case with the Khitan Large Script, there are no surviving dictionaries or glossaries for the Khitan Small Script, and scholars have had to try to decipher the script from the surviving examples of Khitan Small Script texts, mostly stone epitaphs for members of the Khitan aristocracy. The Khitan Small Script is a mixed writing system, with a relatively small number of logographic characters that are used to represent frequently used vocabulary such as numbers and the cardinal directions, and a larger number of phonetic elements (phonograms) that can be joined together into a rectangular block (polygram) to represent the pronunciation of a word. About 380 individual phonograms or logograms have been identified, and scholars have been able to work out the approximate pronunciation of many phonograms. This means that it is much easier to read (though not necessarily understand) Khitan Small Script text than Khitan Large Script text, but it is still very far from being fully deciphered, and as yet we can only confidently recognise some core vocabulary and a large number of Chinese loan words. I have gone through about a dozen published Khitan Small Script epitaphs, and have extracted all the place names that have been identified by scholars working on these texts. I have given phonetic reconstructions for place names based on the phonogram values listed by Daniel Kane in his The Kitan Language and Script (Brill, 2009). For technical reasons Khitan words on this page are displayed horizontally in linear format rather than vertically in polygram blocks as they are in the actual inscriptions (except for "seal script" inscriptions on epitaph covers, which are written vertically in linear format). g-iu-uŋ normally transcribes Chinese 宮 gōng "palace" rather than 京 jīng "capital". The meaning of te-gẻ ~ de-gẻ is uncertain, and has been translated as either "south" for Southern Capital 南京 or "swallow" for Yanjing 燕京, both refering to what is now Beijing. The same name occurs in both Liao dynasty epitaphs (KS:M26, KS:M27) and Jin dynasty epitaphs (KS:M14, KS:M23), but as modern Beijing was only known as the Southern Capital during the Liao dynasty, it would have been anachronistic to call it the Southern Capital during the Jin dynasty, and so it is perhaps more likely that the name was Yanjing, as this name was used during both dynasties. You Prefecture (宥州 in the corresponding Chinese text) is called ei-au g-ün You Commandery 宥郡 in the Khitan text. Qishui County is not a Liao dynasty administrative district, but is here a synonym for the ceremonial fiefdom of Qishui Commandery. 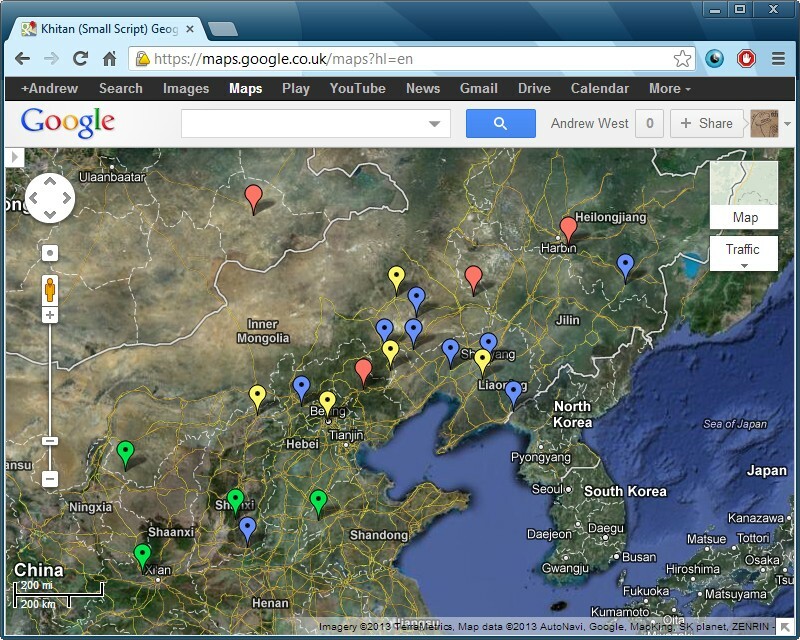 To accompany this post I have created a map of Liao and Jin dynasty Khitan Small Script place names on Google Maps (click on the tags to see the Khitan names, which are written vertically in polygram blocks, as in the original epitaphs).